A mean-mean scatter plot shows a 2-dimensional representation of the differences between many means. The mean-mean scatter plot shows the mean of a group on the horizontal axis against the mean of the other group on the vertical axis with a dot at the intersection. A vector centered at the intersection with a slope of -1 and a length proportional to the width of the confidence interval represents the confidence interval. A gray identity line represents equality of means; that is the difference is equal to zero. If the vector does not cross the identity line, you can conclude there is a significant difference between the means. 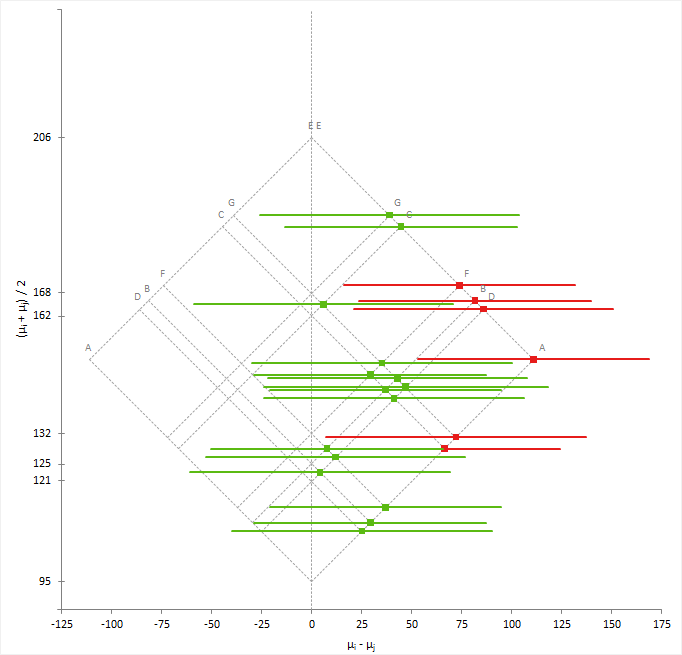 To make interpretation easier, a 45-degree rotated version of the plot shows the difference between means and its confidence interval on the horizontal axis against average of the means on the vertical axis.